"Seven Months After The Fire"
The last load out of the Exhibition gates. Photo courtesy "The Echo". One of the wonderful things to come from my book "Legacies left Untold" is the renewed interest in Duncan & Fraser Ltd. and Duncan Motors Ltd. 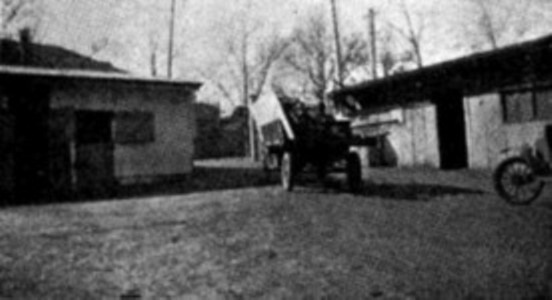 The grainy photo above captures the moment as a Ford 'TT' 1-ton truck carrying the last load and leaving the Northern Annexe of the Exhibition Buildings in September 1923 vacating the site in preparation for the upcoming Adelaide Show. The following article "Reorganising" was written by Howie Spafford, Master Mechanic, Production & Workshop Manager for Duncan & Fraser and appeared in the September 1923 issue of "The Echo". It gives us a detailed glimpse of how the management of Duncan & Fraser Ltd. and Duncan Motors Ltd. coped with their logistical nightmare and kept all facets of the business running under adverse circumstances, particularly in view that the Duncans received no support from Ford Motor Co. Canada, financial or otherwise. It is a credit to both their management skill and the team of dedicated employees that worked for them. "In giving this short article I will endeavour to convey to all interested in our business some of the obstacles that we have met with and how we have overcome them to keep up with our regular work. It is now 7 months since we came to a sudden stop, caused by the disastrous fire, and just at that time we were in a postion which we had been striving for for some months. All departments were well up with our programme, and we were prepared for putting up a record in output of bodies for the month of March. In a flash everything was wiped out, and we had to start under the most trying of circumstances, and we knew that we had the men that could be relied on who were with us wholeheartedly. One look at the ruins showed us that it would be some time before we could replace some of the most important machines necessary for our work, particularly our hydraulic press and dies, which we depend on for our panels. Our friends, Tarrant Motors Ltd., and Davies & Davies, of Sydney, came to our aid with what jigs and forms they could spare for our Standard bodies. Besides losing the whole of our patterns, etc., the tools of the men were gone, and before we could start on new patterns the men had to get new tools. North Adelaide premises were the headquarters for the factory for a few days. The different departments pulled a new Standard body apart to make a new set of patterns, and, this sorted, the next big move was to find premises, and by Saturday, three days after the fire, we had some machines working on Standard bodies. At this point the Motor Department rose to the occasion, and came to the assistance of their fellow workers by working night and day to fix up machines in convenient places, such as a stable in Currie Street, which we turned into a Sheet Metal Department, another stable near by was converted into a Smithy and Vice and Drills Department. We secured a place in Hanson Street, which was converted into a paint and Trimming Department, and while this was going on the body makers were working on presses and forms for the trimmers to carry on their work. Our sewing machines, which are of a special kind, had to be purchased in Sydney, and were hurried across per express train. Another group of body makers were at work making the large cutting out table - the table is a fine job, and will be transferred to Franklin Street in due course. We were fortunate in securing the Northern Annexe at the Exhibition. This was a most suitable place, only we knew we had to get out for the September Show. First of all, it was necessary to cover up the many broken windows to make it both rain and dust proof, and we also had to erect a dust proof paint shop, and erect the necessary hoists and runners for handling our standard bodies. In short time everything was in working order and going well, and on April 12 the first complete standard body was made on the jigs from parts, panels and woodwork, made and machined since the fire. From this date we increased our output up to 16 standard bodies per day, and altogether we built 1,263 bodies of various designs at the Exhibition. The Northern Annexe looked large enough to give us all the room needed, but when we got to this output we were getting cramped for room, so next secured the Machinery Hall, which, at times, was full to the door, and just at our busiest time we had to move out of this building to make room for Poultry and Kennel Club to hold their Show. To do this we had to cover in the three open shed with hessian to take car of the finished cars and bodies, as during this time we were experiencing very bad weather. Soon after we started we could see that we would have to have an extra mill, so we were fortunate in buying F.H. Ring & Co.'s machinery, and rented premises, where we have housed the body makers who make the Studebaker and Special bodies. The telephone arrangements that we have had to install at all depots have been a great help, but at times the Office has not been able to get information at once, although as a whole, I think all the departments have co-operated with each other with the one aim, to push business on, at the same time hoping for the day when we will be housed in our new quarters at Franklin Street. As each department was fixed, so the necessary store had to be arranged, also additional clerks and timekeepers. As time went on we found that we were getting more work than at normal times, and in three months after the fire we had 130 more on our pay roll than previous to February 21. Our transport was a very big item at the time Franklin Street premises were being cleared, and we had 12 Ford lorries working around town, and even these could not keep us going, as we had to call on outside help whenever a shipment of chassis came in. Mile End depot was nearing completion, and we were beginning to make use of it and prepare for cleaning out of the Exhibition. The whole of our stock had to be moved from North Adelaide to Mile End, which took three weeks, and we had as many as six four-horse teams on the job, and our own Ford lorries whenever they could get in. Preparations were made at North Adelaide for the Standard body gang, so that we would not lose any more time than was necessary during the changeover. In the meantime, we had fixed up a paint and varnish room at North Adelaide, and preparations made for the trimmers to work on Ford Standard bodies. The spot welder was dismantled at the Exhibition, and is now installed at North Adelaide. Our transport is till a big item, as we have to over our Standard bodies from North Adelaide to Mile End, and for this we have fixed up a trailer made principally of Ford parts, which allows us to move four bodies at a time, and our Ford Ton Truck with this attachment moved as many as 28 bodies per day. During the move from the Exhibition we counted 145 loads, and we left everything on wheels until the last day. We requisitioned every man who could be spared, and made one day of driving cars and chassis to Mile End. While we were making these changes we were busier than ever preparing a programme of 50 different for Show purposes. The headquarters for the factory are now situated at Mile End, and we have had to make quite a lot of alterations there which include, bulk store, paint rooms, apparatus for the Ford chassis assemblers, al altogether there are 118 men now employed there. As time went on the motor shop were making and rebuilding machines, and at one time we had nine engineering firms in Adelaide either making new machines or making parts to replace damaged machines. All this meant a very big expense, but we were after one point, and that was to get bodies ready for delivery. The Sheet metal Department realised that they had to be ready with their goods first, this was accomplished, and we were able to send finished panels away to Queensland seven weeks after the fire. Our quickwork cutting machine was destroyed, and an Adelaide firm who had a machine something like it kindly loaned us the patterns of it, the Motor Department made the machine, and in a few weeks it was working in the Sheet metal Department. Lately, our original machine has been installed, and the Sheet Metal Department has cut up as much as 20 tons of sheet steel per month." It is fortunate that this material has survived when the Duncans were in total disarray after the fire. The mastermind making all of these plans possible was clearly Howie Spafford. This was not lost on Hubert French when he arrived in January 1924 and quickly recognised Howie and his talent. To the Duncans credit all of the rebuilding was done by themselves and with not a single shred of assistance from either Ford Motor Co., Canada or Ford Motor Co., USA. Do you have information or photographs about the rebuilding after the fire? Have you any information photographs of the Northern Annexe of the Exhibition Buildings? Did you have a relative that worked for Duncan & Fraser Ltd. or Duncan Motors Ltd. through this period? If the answer is yes to any of these questions, I would love to here from you.